Do You Advertise using AR? If Not, You Should Be. - Upcoming Media Inc.
50 years ago, TV, radio, and print advertising were the most common ways of reaching new customers. Especially to those raised in the mid-20th century, they’re still very effective today, despite the fact that they offer no means of customer engagement. But with the rise of digital and social media advertising, customers’ expectations have risen. Opportunities to click, like, share and comment on online ads have empowered audiences to engage with their brands, which allows the brands to build stronger relationships with them. A newer generation with increasing buying power has now come to expect a certain level of engagement and interaction with their favourite brands. With augmented reality, customers can now go beyond engaging with the brand to integrating ads into their real-world lives. With forecasters predicting that 200 million people worldwide will use mobile AR in 2018, many brands have already implemented marketing strategies that provide their audience with completely immersive AR experiences on a whole range of products. For example, let’s say you come across an AR ad for sunglasses. The glasses look great, but how do you know how they’ll suit you without trying them on? With AR, you can find out by “placing” them on your face using your smartphone camera. Not sure about those particular sunglasses? Try on as many different pairs as you want. When you find a set you like, you can click to purchase them right away. If you enjoyed your shopping experience, you’ll want to snap a pic with you and your new sunglasses to share on your social media stream, potentially sending the ad to thousands of new customers. But why stop at glasses? AR can also be used to try on shoes, clothing, jewellery, watches, and more. You can “place” a couch in your living room, or “park” that new car in your driveway. In all of these cases, AR experiences have the unique ability to build an immediate emotional connection between product and consumer, which can leader to faster sales. Facebook and Snapchat, two of the world’s biggest social media platforms, are already offering brands the opportunity to embed AR advertising in their users’ feeds, with plans to grow their AR investment into the future. In addition, Facebook also announced they will be introducing AR ads to Instagram. For brands, this opens up the potential to reach millions of customers all at once, without social media users having to download any additional apps or software. The entire AR experience takes place within the social media apps, including a direct link to a shopping cart and checkout portal. Millions of people of all ages and in almost every country already use Facebook, Snapchat, or Instagram apps to communicate using images and video more so than voice. Since the users have already adopted visual communication as the standard, marketing to them using AR is a logical choice. Plus, the interaction with the consumer parallels those they have with their friends, enhancing the emotional connection with your products. This isn’t to say that brands shouldn’t consider creating and managing a proprietary AR app if it’s more suitable for their purpose. Proprietary apps can be used for brick-and-mortar stores or print catalogue experiences, public events, or to reach a customer base that doesn’t use social media. Allowing online consumers to experience their products and services first hand, without having to make a trip to the mall, has the potential to transform how people buy – forever. This even extends beyond consumer-packaged goods. 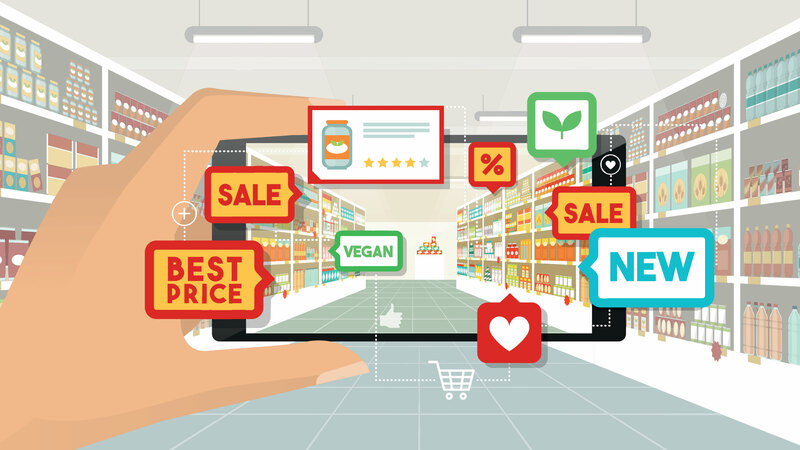 You can use AR to educate consumers about your product, such as a supermarket providing nutritional information about their food and beverage items at the touch of a button. Travellers could also experience immersive 360° views of hotel rooms, learn about hotel amenities, or even “stand” on a sunny beach with one click. Advertisers 50 years ago might not have even dreamed the way we can market to consumers today. Back then, it was the stuff of science fiction. Now, it’s becoming the norm. Why? Many of those old-school advertisers might tell you to that the secret to success is creating an emotional connection between the customer and the product. AR technology takes that to a whole new level. With brands immersing consumers into their world, and creating an experience that builds and reinforces that emotional connection, we may never buy or sell the way our grandparents did ever again.